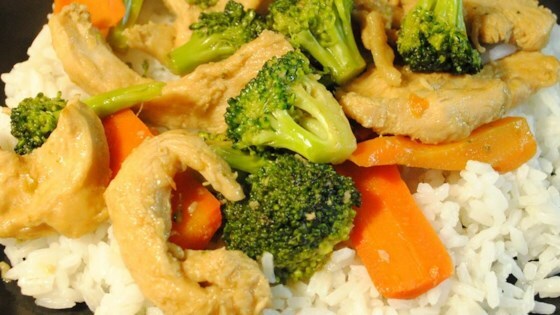 "A quick and easy dish to prepare, this chicken stir-fry is packed with veggies. Try adding bean sprouts, bamboo shoots, snap peas, or any of your favorite vegetables. Serve it with white or brown rice, or noodles." Remove chicken from marinade, reserving liquid. Heat 1 tablespoon sesame oil in skillet over medium-high heat. Cook and stir chicken until slightly pink on the inside, about 2 minutes per side; return vegetables and reserved marinade to skillet. Bring to a boil; cook and stir until chicken is no longer pink in the middle and vegetables are tender, 5 to 7 minutes. Serve over rice. this was decent. I liked it but it needed a little more asian flavor to it for my liking. It was not bad though! Really great recipe! I added snap peas because I love them. I also added some hot oil to give it a little more kick. (We like spicy stuff!) Will make this again.